Wow. That was awful. I like campiness. I enjoy B-movie schlock. But this was terrible. It wasn’t even so-bad-it’s-good. The Chase is a Dalek story, but only barely. And even the Daleks were disappointing. Terry Nation must have been having a bad day. I suppose the concept was alright: the Daleks develop a time machine that is capable of tracking and following the TARDIS. Not the best concept, but it could work. However, it does not work. It stinks. Here’s my impression: Terry Nation had a bunch of concepts that he couldn’t/didn’t develop. So, he strung them all together into a single, incoherent, poorly directed story. One thing I liked happened at the very beginning of the first episode. We see the Doctor, Ian, Barbara, and Vicki just chilling in the TARDIS. It was a neat look into their “daily” lives, if there can be such a thing. During this scene, the Doctor is building some machine that allows them to view any moment in time. Do they use it to see what Susan is up to? No, no. They watch the Gettysburg address. And, The Beatles. They view a clip fromTop of the Pops from 1965 in which the band is playing Ticket To Ride, a great tune. (Interestingly, the 25 seconds that appear are the only surviving moments from that show that apparently fell victim to the great BBC destruction of the late-60s/early-70s.) Ian and Barbara begin dancing and singing along. Now, they left London in the Fall of 1963. Beatlemania was in full swing, but the chances of two teachers in their late 30s enjoying it I would suspect is low. Nor would they know the words to Ticket To Ride. That aside, Vicki notes that The Beatles remain famous throughout history. Wonderful foresight, there. I can’t imagine a show in 1998 that would dare to claim Hootie and the Blowfish would become lasting classical music. But back to the story. The travelers end up on some desert planet, and the Daleks arrive. How do the Daleks get around so well in the sand? Then, they go to the Empire State Building. Here we meet an irritating and stereotypical tourguide. That speaks with such an awful fake New York accent….”Heah in da tawllest buildin’ in da woild…” and an even worse Alabama boy with an even worse accent full of “gawl-ly” and “aw shucks.” While I’m sure that Brits don’t actually believe Americans sound like these people, I’m going to take this opportunity to say: Americans don’t actually sound like those people. Then, they end up in a haunted house. And Barbara, Ian, and Vicki are terrified. Terrified? They’ve fought Daleks, burned Rome, defeated the animus. And the cheesiest haunted house in history sends them running for the hills? And why did Frankenstein actually attack the Dalek? Am I to assume he would attack a person? That’s not a very well-designed theme park attraction. They land on the Marie Celeste. A boat that turned empty because the entire crew abandoned the ship for fear of the Daleks, beings they’d never met and who made no attempt to harm them. Simply asking “Where are the time travelers?” was the deadliest weapon ever. Way more efficient than the weapon that turns victims into photographic negatives. and how did the Daleks get up the stairs? The story looks up a bit at the very end when the travelers are holed up in a cave, waiting to blast the Daleks with some strange machine the Doctor built. But it’s better when they are taken prisoner by the robot inhabitants of Mechanus (the Mechanoids?). They become exhibits in a zoo and meet Steven, who has been held prisoner for two years. He has apparently made a stuffed panda bear his best friend. His captivity has made him, as one from Alabama might say, crazier than a shithouse rat. So crazy, in fact, that re-enters the burning building to find his stuffed panda. Not even Tom Hanks jumped in the ocean to retrieve his volleyball. The last we see of Steven, he is practically crawling through the forest. However, my reading of some other reviews tells me that he is a new traveler that is going to join us in the Time Meddler. I didn’t really see enough of him in this to make much of an evaluation of him as a permanent character. I suppose he is valiant, going back in after the panda and such. I’ll have a better idea after the next story, I suppose. The most important part of this horrible, useless story was the departure of Ian and Barbara. The Dalek’s time machine is apparently superior to the TARDIS in that it’s not broken. They can actually control where it goes. 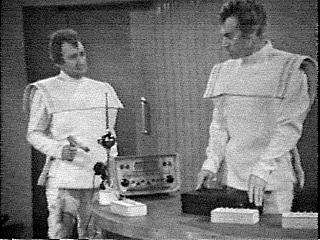 So, once the Daleks are defeated (in a surprisingly well-done battle with the mechanoids), they ask the Doctor to help them work it. The Doctor is angry, but Vicki tells him that it’s their choice. This whole exchange was done well..but the actual departure was, like the rest of the story, a let down. When Susan left the interaction was touching. This time all we got was an angry Doctor storming into and back out of the Dalek machine. Then, without a visible goodbye, Ian and Barbara were gone. It didn’t seem like Terry Nation knew how to handle the leaving, so he almost didn’t handle it. He kind of reacted like the Doctor..angry and then dismissive. The Wikipedia tells me that in the original script Ian and Barbara do not leave…so I wonder if this was a sudden decision written in at the last minute. 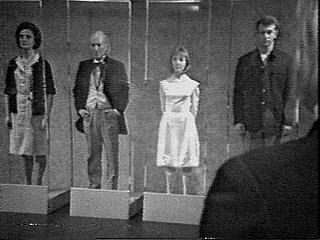 As if they realized the departure was just as awful as the rest of the story, the writers put in a photomontage of Ian and Barbara enjoying London and the Doctor and Vicki watch them on the fancy time-watching device. It brings some better closure, but them leaving the show, especially after the farewell Susan received, seemed rushed and not very thoughtful. Overall, this story sucked. The Daleks were no longer evil villains, but stammering idiots. The story was a hodgepodge of junk and B-Sides. Ian and Barbara’s farewell was handled poorly. We didn’t get a very good introduction to the new character. This was by far the worst story of the first two seasons. I’ve heard/seen good things about the Time Meddler, the season 2 finale. I like the injection of time plots in these last three stories (Space Museum, Chase, and I’m guessing the Time Meddler based on the title). I hope/imagine that they are starting to set up some more serious show mythology. The Crusade ended with a creepy scene in which the travelers are in suspended animation. I thought it was a good sign for the story to come. And, after watching the first episode of the Space Museum, I was not disappointed. It turns out they were frozen because the TARDIS was in the process of jumping a time track. When they were able to move again, their clothes had been changed (unconcerned, the Doctor notes that they have been saved the bother of having to change themselves). Things they do seem to have no impact on their environment — Vicki drops a glass that fixes itself. In a nice, subtle touch, as the Doctor drinks the water, the level does not decrease. They don’t leave footprints, and other people on the planet cannot see or hear them. They’ve landed on the planet Xeron, home of a space museum. And after walking through it, they discover themselves in cases. They have jumped the time track and ended up in the future. They then had to wait for themselves to arrive so they could prevent their display-case future. I love time travel paradoxes. And the idea that if you’re in the future you have to wait for the present to catch up is one of my favorites. I first encountered it in the Stephen King miniseries and novella The Langoliers in which King deals with the issue mostly in the past, but also in the future. This made me very excited for the rest of the story. And while the remaining three episodes didn’t really deal with the time track (except to point out yet another broken piece of the TARDIS machinery), I enjoyed them just the same. Much of the action involves getting lost in the museum’s corridors, which is kind of boring. But my enjoyment of the time paradox kept my interest. In an entertaining segment, the Doctor, having escaped being captured by Xeron rebels, is hiding in a Dalek case that is on display. He says something in a Dalek voice as he pokes his head out of the top. 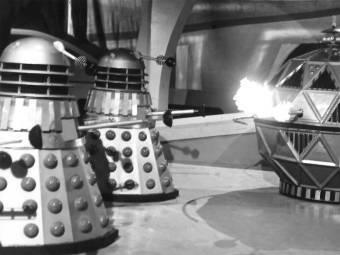 Interestingly, Vicki says that she always thought the Daleks seemed rather harmless. This reminded me of my first impression of them that they were kind of innocent villains. 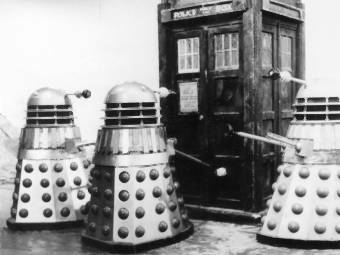 More on the Daleks later. In another scene, he outsmarts the Moroks, a group of space-colonizing aliens that have taken over Xeron. They have a TV screen that shows the Doctor’s thoughts, so he thinks of humorous things like a bicycle instead of the answers to his questions. It doesn’t help, however, as he gets sent to the Preparation room to be prepped for the display case. Vicki ends up with the Xeron rebels who are incredibly incompetent. They apparently can’t figure out that they need to obtain weapons in order to defeat the Moroks. But Vicki lets them know what’s up. And her suggestion of storming the armory is what changes the future. One of the more exciting scenes is the laser gun battle between the rebels and the Moroks. The rebels and Moroks were, for the most part, pretty anonymous. As is common in depictions of alien races, they all had incredibly similar facial features and hairstyles (stereotypical faceless foreign enemy, anyone? Like the Japanese in WWII movies.). The Morok governor is bored with his job and therefore kind of boring to watch. The only Xeron name I could discern was Darko. In general, the story wasn’t very exciting. But I liked it anyway because of the time concept. I’ve read some other reviews of some of the stories, including this one and The Crusade. 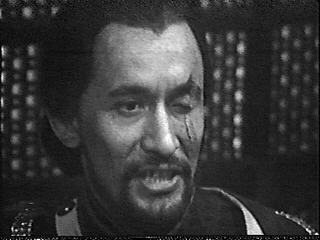 It seems that this is widely held to be one of the worst Doctor Who stories. And everyone seemed to love The Crusade. I really enjoyed this one and didn’t care much for the Crusade. This seems to be a bit of a trend where I don’t really agree with the other reviews I see. I’m not sure why that is. I can’t be that different from your typical Who fan, except for my knowledge of the series. I wonder if my opinion of these early stories will change as I learn what the show is capable of. One review called the Space Museum B-grade science fiction. I may be wrong, but I was under the impression that ALL Doctor Who was B-grade science fiction. That’s part of the reason I became interested. Ridiculousness like stopping bombs with door props and laser-gun shoot outs are part of the appeal. I must admit that I’m kind of tiring of William Hartnell. His “hmm?” and “he-he” habits are irritating. He seems to be phoning in his performances. He figured out what worked and kept doing it. I have a feeling that if he remained the doctor, the show would not have lasted. His character was getting stale. And Ian seems to be getting grumpier. He’s more easily angered these days. The show definitely seems to be heading toward some form of climax, probably in the Time Meddler, the season finale. I’m not sure when the Doctor changes, but I know it’s coming soon. Before that, though, there is the 4th episode cliffhanger. As the TARDIS leaves Xeron we cut to a Dalek watching it move through space. They say that our heroes are once again traveling and that they must be caught and (of course) exterminated. A couple of things of note here: The Dalek calls them their biggest enemy. This, I would guess, sets up the Dalek mythology for the rest of the series. This is likely the moment they went from occasionally recurring villain to archenemy. Second, the Daleks now seem to have their own TARDIS-like machine to follow the Doctor’s crew. Some questions: When did the Doctor become the Dalek’s greatest enemy? 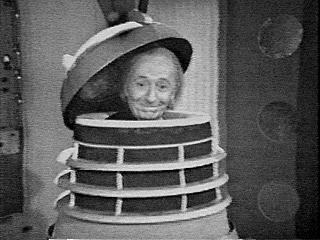 Given the timeline issues between The Daleks and the Dalek invasion of Earth, this could happen at any time. When are the Daleks? Does the Dalek timeline ever become clearer? Can they only track the Doctor when the TARDIS is moving? The next story has all indications of being a Dalek story, something that I was not expecting. Now that I have returned to regular Who viewing, I’m looking forward to it. This is another story I’m rather ambivalent toward. Part of that comes from the BBC destruction of two of the episodes. And the audio that exists for episodes 1, 2 and 4 is quite bad. We are lucky to have it. The wikipedia tells me that it wasn’t found until the 1990s, so at least we have it. But that doesn’t change the fact that I didn’t really like the story very much. The version that I watched opens with an old William Russell, acting as Ian, saying how he and Barbara didn’t tell many others about their time with the Doctor, but he feels he can trust us. This clip is in color and is apparently from a VHS release in the mid 1990s in which Russell tells the story of the missing episodes. He’s hanging out in some giant mansion we are to believe is his house. They must pay science teachers well in England. After this intro (the rest of Russell’s descriptions weren’t included in the version I watched), we see the TARDIS appear in the forest outside Jaffa, which is apparently near Jerusalem. It is an historical story of the third Crusade and Richard I (the Lionheart). I feel that it was meant to be educational, but I’m not sure how much education one could get…not that Wikipedia is the best source in the world, but the entry for Richard I does not mention Jaffa or that he tried to trade Joanna for peace. In the story of Dr. Who the city and her marriage are major plot points that in previous historical stories have been fictionalized, but left as semi-accurate nods. Such as Nero burning Rome or The Polo’s dealings with The Kahn. 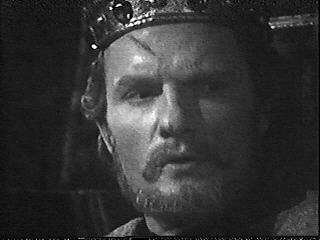 At any rate, Richard’s forces are ambushed in the forest and The Doctor, Ian and Vicki take an injured man to the king. Barbara had been captured along with another of Richard’s buddies. Ian wants to rescue her, but Richard isn’t a fan. Eventually, though, Richard sees the light and makes Ian a knight, Sir Ian of Jaffa. A big deal. Sir Ian then travels to see Saladin who is keeping Barbara. Now, a note about ole Barbara in this story. What a trooper. She escapes captivity three times in a four episode story. And she always does it pretty easily. Or at least it seemed that way just watching the still photo reconstructions. A grunt and a run and she was gone. She gets away and is helped by Haroun, a man whose daughter had been captured by El Akir, the Saladin’s goon. But, of course, she is recaptured by El Akir, the villain of the story, she escapes again only to hide in the Harem. This is also known as the room in which El Akir keeps all the hot women. Ian arrives with the ridiculously giggling bandit Ibrahim, who had earlier tried to rob him. The two of them burst in just in time to rescue Barabara from the The Akir who is killed by Haroun. Oh, and Haroun’s daughter was conveniently a member of the Harem and tried to help Barbara escape. 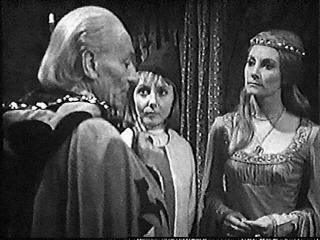 The doctor and Vicki, branded as traders, escape Richard’s court and after Sir Ian convinces some guards that he will excute the traitorous Doctor, the escape into the ship. This is the best part of the episode. In the only known remaining footage of the fourth episode, the TARDIS lights go out and everyone is left in suspended animation. It’s wonderfully creepy and has me excited for the next story. But first, some thoughts on this one. In short, it just didn’t do it for me. I kept falling asleep and I trouble hearing it. I’ve had this trouble before, but had no subtitles to fall back on. And the reconstructed episodes are a little difficult to follow at times. It just didn’t keep my interest. El Akir wasn’t a very compelling villain (not like Tegana of Marco Polo) and Richard, while well acted, simply didn’t appeal. My favorite character was Haroun. I like the resilience he showed and the dedication to finding his daughter. Not to mention being able to protect his younger daughter both from the soldiers and from the truth of what happened to her sister. I was also a fan of Barbara’s tenacity and escapability. But that was about as far as it went. To be honest, I’m kind of tired of seeing Ian in fighting mode. I just don’t buy him as a fighter. He’s a bit of a wet blanket in my opinion. He learned to fight in The Aztecs, got some sword play in the Romans and shows off his skills now and then. But, seriously, he was a mild mannered Science teacher. Now he can be a gladiator and a valiant knight? I know knights aren’t all about fighting, but he does his fair share. And it bores me. I think this story also may have suffered due to The Doctor’s somewhat limited role. He and Vicki were once again left alone together. The Doctor talked his way out of a jam, but this had none of the comedic flair of The Romans. One thing that this time alone with Vicki has shown us, though, is the development of their relationship. It is very tender and endearing. Their interactions are fun to watch as she teases him and he coddles her. The Doctor seems to be building upon the connection he made with Susan just before he left her in Future Earth. It’s as if their relationship continued to grow, but with Vicki instead of his actual granddaughter. It makes Vicki a likable character. She’s silly and sweet and I think much of that has to do with her time with the Doctor. In the end, this just wasn’t a very good story, in my opinion. Dr. Who really seems to be at its best in actiony sci-fi stories. Unless the historical stories have something special, I think it’s time to consider leaving them behind. And this one just didn’t have anything special. I’m not sure how I feel about this story. It had an air of uniqueness about it, and was certainly ambitious for its time…but the alien beings on Vortis (the web planet itself) were kind of lame. I wanted to like it….but I feel kind of ambivalent toward it. The TARDIS is sucked down onto the planet by some unknown force. It turns out that the animus, a large, evil creature who has enslaved the planet’s inhabitants is responsible for this and creating the web that encases the planet (or most of it at least). Since the TARDIS cannot take off, Ian and the Doctor go to explore. This is the first time when I couldn’t decide how I felt. The light on the planet makes everyone look blurry or luminescent or something. It was like when you have a smear or water on your glasses and then look at a light and everything streaks. It gave a bit of mood, but it kind of made my eyes uncomfortable. I kept trying to focus. It was like those Claritin commercials before they take the allergy medicine. The planet is inhabited by the Menoptra and the Zarbi and the Zarbi’s pet dust ruffles. And some Menoptra descendants that live underground. For, I think, the first time, there are no humanesque characters in the story. And, also for the first time, we have a race that does not speak English. The Zarbi, giant ant-like creatures, communicate via squeals and beeps and other noises. The Zarbi are the animus’s slaves and they and the dust ruffles apparently roam around, take prisoners, then put them to work shoving organic matter into the animus’s furnace. I like the Zarbi. They’re a little corny…men with ant bodies on running around. And there’s a nice spot where one runs into the camera. But I found the fact that they didn’t speak a human language and seemed to be best friends with the dust ruffles kind of a nice touch. The Menoptra, however, are the source of my discomfort with the story. They’re kind of like the Sensorites in their timidity…but why did they keep moving their hands like they were performing magic at a birthday party? And they seemed to give up so easily. They figured that since their special guns didn’t work that the animus would just control the planet forever. I guess this isn’t that different from some of the other races the travelers have encountered (remember the stupid Thals? ), but it kind of irritated me this time. What I did like about the story was how we learned a bit of the history of Vortis. We learned that the menoptra had some sort of religion, and that their ancestors were split up, some of them forced to live underground. Those underground were afraid of the light and dreamed of flying like the surface Menoptra. I also liked the bit of redemption for the Zarbi. They were cruel only because they were enslaved. Once the animus was dead, they stopped trying to capture. What I also liked about the story was an increased role for Vicki. I like that she paniced and tried to steal the TARDIS, only to have it dragged away. She played a consistent role in the plan to defeat the animus and escape, although she succumbed to its bizarre power at the end, leaving Barbara to throw the snitch or whatever it was in the final confrontation. She showed some cleverness in fooling the Zarbi by putting the broken paralysis necklace on. It was a key part of her and the Doctor’s escape. This escape was orchestrated by the Doctor delaying his report to the animus, who communicated with him by speaking English through a tube-like device. There was a key Doctor moment when he said in his most cantankerous of voices “Bring down that hair dryer or whatever it is.” Which, by the way, the Doctor could use. His hair seems to be getting a bit unruly. It was an interesting way to set up communication between the two…but where did the hair dryer come from? Maybe the web was closed at the top? The animus was below them…who knows. The Doctor gets his hair done. We got a chance to see the TARDIS interior from a couple of new angles. It seems that the producers have now built an entire room rather than just a backdrop. It gives the ship a better feel. It seems more real, although I was slightly disoriented at first. I was convinced that the ship had changed. But I don’t think it has, there’s just more of it. Although the melted clock from the Edge of Destruction is gone. They must’ve thrown it out since it was melted. In another first (I think), the episode did not end inside the TARDIS with the travelers. Instead, we saw the Menoptra talking about the future of their race and planet while the Zarbi wander about. It was a different kind of ending. The graphic told me the next episode is The Lion, but Wikipedia tells me that in Arab regions (is that the correct way to say that? ), the next story (The Crusade) was not shown, so it had a different graphic there. A neat bit of trivia. Since I am not living in an Arab country, however, The Crusade, apparently another historical story, is next for me. The Romans is a truly enjoyable story. It has a great mix of humor, which was my favorite part. The story begins with the TARDIS falling off of a cliff into some bushes, an event I wasn’t exactly sure why it happened. I thought perhaps at the end they would wake up and it would all be a dream and they had been knocked out in the fall, but nope. Plus, it wouldn’t make sense for them all to have a dream together. I suppose maybe the Doctor could have dreamed it and they could wake him up and he could bust out “and you were there, and were there, and even you!” in classic Dorothy style. But, whatever, that wasn’t the case. What WAS the case, though, was that our heroes were squatting in some rich dude’s Italian villa just outside of Rome. When we catch up with them, they’d been living there for almost a month! I felt like this was a bit out of their character…lounging in someone else’s house, uninvited, presumably wearing the owners’ clothes and drinking their wine. Also, they were selling his produce at bargain basement prices. Thieves. It was an interesting historical/educational episode. Although I think the educational aspects were toned down a bit compared to the interminable Reign of Terror, they did a nice job making Nero look like an absolute loon, and worked in the burning of Rome nicely. It was amusing that it was the Doctor’s accidental idea. We got to see Ian show off those fighting skills he learned in the Aztecs fighting as a Gladiator. It would have been better to see him fight in a giant arena. Highlighting the humor was the scene in which the Doctor, Barbara, and Nero chased each other through the hallway a la Benny Hill. I could almost here the music playing as they ran up and down the corridor, poking their heads into different rooms and just missing one another. We got our first look at Vicki in action and, unfortunately, she didn’t really do very much except follow the doctor around. She was kind of superfluous. I have a feeling this may be what they had in mind for Susan’s character, but Carol Anne Ford’s own thoughts on the character kept getting in the way. I hope that they realize it’s a mistake and give this character slot a more active role. Susan and Vicki both have so much more potential. Finally, there is some indication that twentieth century English is not common to all beings in the universe ever. Barbara corrects Vicki once or twice to make her language seem more Roman/Latin (Londinium). A couple of characters also note the strangeness of the the names Ian and Barbara. I thought that was an acknowledgement a long time coming. I understand that they can’t have everyone speaking a different language….but a “the TARDIS helps us to communicate with all races” or something would be sufficient. Strange note: the travelers’ Roman friend Tavius is shown holding a cross that he wears around his neck. 64AD is awfully early for any Romans in Rome to practicing Christianity. In light of that, I wonder why they chose to show the cross. Only Christians can be good people? Couldn’t he have been a good Roman without it? I tried to look him up to see if he was supposed to be someone famous, but found nothing. Just an odd production choice, I guess. Or maybe there’s a religious theme to the show that I have not yet picked up on…I’ll tag this one just in case. Finally, the old romantic notion between Ian and Barbara reappears at the end of the story. Once they learn they have arrived back at the villa they are squatting in, it looks like they’re going to drink some wine and get busy. There’s even some good-natured pillow fighting. But, alas, they fall asleep and the Doctor returns. I enjoyed this story a lot. I’ve found the historical stories so far to be rather bland, but the humor was good and the story moved along pretty well. It seems that Susan has been entirely forgotten, but Vicki is a suitable replacement for me. Let’s just hope they actually give her something to do. And forbid her to scream. The Rescue is a two-episode story that existed solely to introduce a new traveller, Vicki. As far as stories go, it was less than awesome. It’s a rarity that may have benefited from another episode. I was most interested in the actual residents of Dido, who make a brief appearance at the very end without much explanation. First, we meet Vicki and Bennett. They’re waiting for a rescue ship and Bennett can’t walk. They’re apparently being held prisoner by Koquillion, a strange alien being that we are led to believe is what those who live on Dido look like. He claims that his people had killed the rest of the humans’ crew and he was protecting the two of them from further attack. The two humans seem to fear Koquillion. Meanwhile, our three remaining travelers land in a cave. Again. Doesn’t the TARDIS have some program that keeps it from landing inside things like tombs, caves, and spaceships? Just another example of a previously noted design flaw. The Doctor seems distracted, perhaps a little depressed, by Susan’s absence. Ian and Barbara are being very understanding, but, curiously, seem to barely even notice that she’s gone. They got over it pretty quickly. Cold hearted bastards. For whatever reason, the Doctor is very sleepy. Maybe it’s his depression. I’ve seen the commercial for medication — everyone suffers when you’re depressed. Even the dog. In this case, Ian and barbara suffer, forced to venture outside alone where Koquillion greets them, pushes Barbara off a cliff and causes a cave-in on Ian and the Doctor. Unfortunately, the cave-in leads to more cave jumping, an adventure that takes up half of the doctor and ian’s screen time, it seems. In the end, Koquillion is really Bennett (What a twist!). he’s dressed up in some fancy ceremonial robes. We know this because the Doctor had previously visited Dido and knew them to be a peaceful race. One without crazy heads and murderous tendencies. When death is imminent, the real Didoans show up to save the day. Then promptly disappear. One thing that was a bit irritating with this is that Bennett’s motives are not very clearly explained, or at least don’t make any sense (he wanted to kill people, but not have anyone know he killed them? Why did he kill them to begin with?). This was also the case with the human villains in The Sensorites. I wonder if there was some sort of unwritten code or a different understanding of humanity in the pre-turmoil sixties (If it were an American show, this would be pre-Martin Luther King and robert Kennedy assasinations, pre-watergate, pre-woodstock, pre-Kent-State, pre-large Vietnam protests) that prevented the writers from being able to clearly articulate or explain human treachery. I don’t know. Maybe it’s just poor story telling. So, how about Vicki? She’s alright. She has a bit of Susan’s dependency issues, but she’s also a bit more fiery than Susan. I’m afraid she might lack a bit of the intelligence that Susan’s character occasionally displayed, and definitely lacks the intriguing alien side story weirdness, although that was never really developed. In an odd moment, when Vicki introduces herself to Barbara, Barb asks if her name is Victoria. She responds “No. Vicki. V-I-C-K-I.” Was this a necessary interaction? Why did she spell her name like that? I thought that was a strange response and may signal a bit of headstrongness in her character. We’ll see how she develops, will she be written as weakly as Susan or will she be a bit strong like Barbara? Or even stronger? It was difficult to tell in this very short introductory story.